Well, it’s finally the end of football season except for the playoff games and of course…The Super Bowl. We all have our favorite teams, and I’m no exception. My Seattle Seahawks, again are in the playoffs, and the 12’s, the Seahawk Fans, are ‘Ready for some football’! The old Monday Night Football song featured Hank Williams Jr. singing, “Are you ready for some football?”, was something I looked forward to every week. And for the most part, the games were absolutely worth waiting for. They were PREMIER MATCHUPS of equally matched teams, bound to have some wonderful surprises with some extraordinary highlights. In THE BOOK OF AMOS in the Old Testament, we can also see a premier matchup of teams NOT equally matched at all. BUT…there are still bound to be some probably NOT so wonderful surprises but some extraordinary highlights! 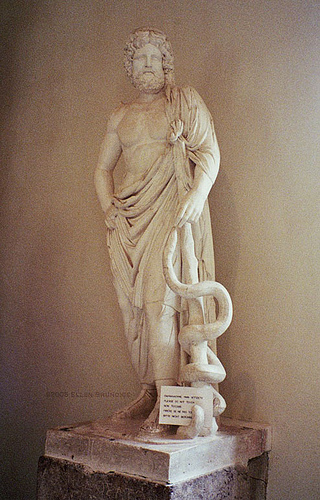 It will be as though a man fled from a lion only to meet a bear, as though he entered his house and rested his hand on the wall only to have a snake bite him. Will not the day of the Lord be darkness, not light–pitch-dark, without a ray of brightness? “I hate, I despise your religious festivals, your assemblies are a stench to me. Away with the noise of your songs! I will not listen to the music of your harps. Contrary to what you might think, AMOS was neither a prophet nor the son of a prophet to begin with(7:14). He was a herdsman and a dresser of sycamore trees…actually, a wild fig or mulberry fig tree. So while AMOS was tending sheep and dressing trees…he became aware of the conditions of his day. Today’s awareness of surrounding world conditions, might be around the water cooler. 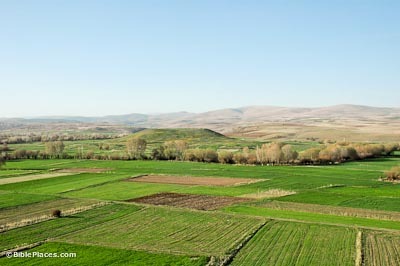 Amos’ day conditions were discussed around a sycamore tree or while he was herding the sheep as caravans passed along a well-traveled highway. Wealth abounded…actually, it was an either or situation. On one hand there was luxury and self-indulgence, and on the other…there was absolutely miserable poverty. I’m sure you have seen videos of the homeless camps fixed under overpasses in our cities today. The GOVERNMENT was corrupt…there was evidence of extortion…there was riots and violence in the streets and CLASS was hated. Dishonesty was the rule rather than the exception and there was also a gross indifference to the suffering. Outwardly, it seemed that RELIGION was thriving in and around the center of population…attendance soared while the treasuries bulged…BUT…inside there was sickness. The priests were professional leeches. They would preach exactly what would tickle the ears of the people. There was so much hypocrisy and insincerity in the assemblies while real RIGHTEOUSNESS was hated and oppressed, sometimes violently. In my study this past week, all this became painful for me to read and understand. This period of PEACE and God’s GRACE…instead of being grateful to God for their peace and prosperity He had given…they used this time to plunge into the pool of sin. Much like America is today…outwardly it seems like things are going pretty well…BUT on the inside, decay and rottenness. AMOS saw the JUDGMENT of God coming upon the nation but the greatest threat, then and now, lies in the religious community!!! In Chapters 1 & 2…AMOS speaks of JUDGMENT on the surrounding nations. The people really like that part. Notice that Amos repeats the phrase, “For three sins…even four” (vs. 4, 6). He uses this formula to focus attention on the FINAL ITEM–GOD’S ‘FINAL STRAW’! AMOS doesn’t list the first three sins, but moves directly to the fourth, bringing the JUDGMENT of God down to the actual audience to whom the message is directed–ISRAEL. Israelites of Old Testament times looked for the day when God would intervene in the affairs of the world, righting the wrongs and establishing His rule on the earth. For the first time in Scripture, the concept of the DAY OF THE LORD is introduced. The term appears only in the prophetic. AMOS gives us a clear picture of what the Day of the LORD would be like for the people. 1st it would be a time of DARKNESS–not light. People thought it would be a bright, happy time of celebration…tickertape parades…dancing in the streets, etc.. Instead, it would be a time of unparalleled hopelessness…There would be no place for them to escape the JUDGMENT OF GOD! He says it would be like a man who would run from a lion only to meet a bear; from something ferocious to something even worse! In desperation this man manages to reach his house–a place of safety and shelter. He arrives breathless, leans his hand against the wall to catch his breath…and as he does, hidden in some crevice, a snake bites him. The DEATH he thought he would escape awaited him at his own house. NO SAFETY…NO ESCAPE anywhere! This is a far cry from the joyful expectations the people of Israel had. Each of the ESSENTIAL ELEMENTS of their worship was examined and in each case…they were totally rejected by God. What God required was not the RITUAL or the OFFERING, but rather RIGHTEOUSNESS in the courts, in the marketplace, in every aspect of their conduct, because this is what it takes to WORSHIP GOD…not the outward show. But these “saints” all still performed their duty on occasion…and think it will be enough to cause God to overlook the SIN in their everyday life. But their COMMITMENT to God is revealed in their lifestyles. BUT God HATED and DESPISED it. He said take it away…Get it out! 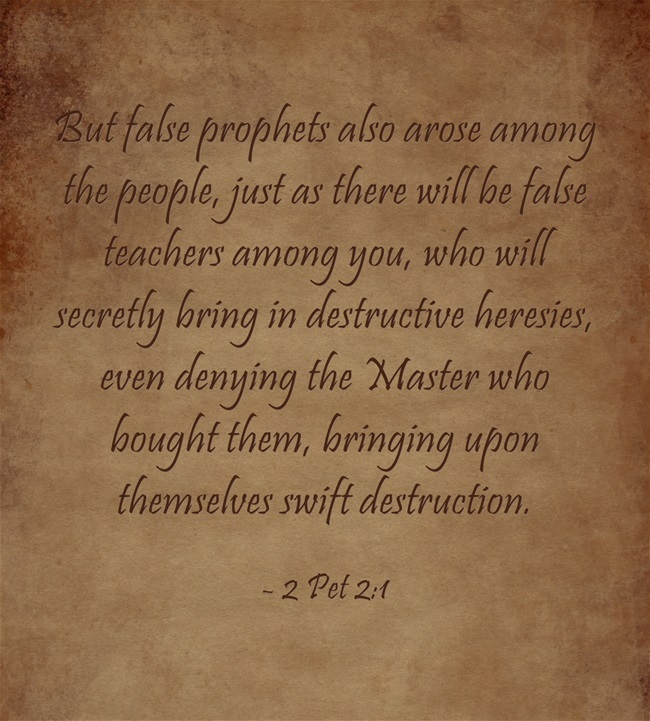 (verse 22). How About the WORSHIP MUSIC in the Congregation? MUSIC was an important part of their worship, as it is today in our church services. —HOW COULD THEY MESS THAT UP? It had all the right words…the music was sweet to the ears, but it wasn’t offered to God…it was just the next step in the process. When we sing, do we mean what we say? Now, this has not been all too pleasant reading so far…it’s been pretty negative. But when God deals harshly with His people, it’s always REDEMPTIVE in nature. It’s never meant to beat you down…rather, it’s to help us get our focus back on Him. That brings us to VERSE 24 – BUT…LET JUSTICE ROLL! What is AMOS referring to here? He wants us to do a turn-around! Act justly. Be honest! That means in our everyday life, in our dealings with others…whether business or social relationships. Don’t take unfair advantage and treat everyone as God Himself would treat them. It also means being HONEST before God…recognizing our true nature–who we are in Christ Jesus. RIGHTEOUSNESS like a never-ending stream. JESUS said, “He that drinks of the water that I give…out of his belly shall flow rivers of living waters” (John 7:38 – KJV). That’s what is available for you and I today. We need to examine ourselves where we are in life…examine our motives–honestly, and make whatever adjustments the Holy Spirit tells us to do. And then, and only then, can we truly long for THE DAY OF THE LORD. Footnote [i] : Dr. Claude Mariottini – Professor of Old Testament, AMOS’ Occupation, June 17, 2014. It is possible to read the writings of the prophets only as valuable contributions to Old Testament history. And, the reader may even be enriched by familiarity with their prophecy of events which have been startlingly fulfilled. But to stop there is by no means to grasp their full and outstanding purpose for today’s living. Right now, God is speaking definitely and definitively to every nation and every individual. He wants that we see ourselves as He saw us–a world of nations and individuals rolling down the hill towards disaster [*See Footnote [i] ]. Blessed (happy, fortunate, to be envied) is the nation whose God is the Lord; the people He has chosen as His heritage. Behold, the Lord’s eye is upon those who fear Him [who revere and worship Him with awe], who wait for Him and hope in His mercy and loving-kindness,  To deliver them from death and keep them alive in famine. 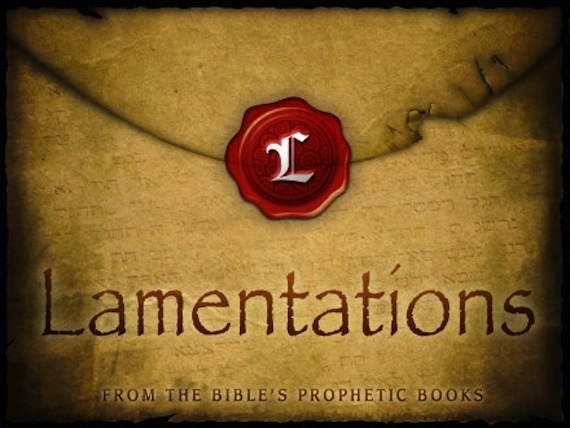 Although the above Scripture verses are the keys to this Blog study, I believe that God’s dealings with Israel throughout the entire Book of Lamentations is A PICTURE–a perfect example of His dealings with AMERICA, and perhaps your nation, right where you are today. Israel had played the harlot in her spiritual adultery of IDOLS & prostituting themselves to the SURROUNDING NATIONS. The word itself–APOSTASY– is from the Greek word “apostasia” a meaning very much like renouncing or dissociating oneself from a particular religion or certain religious beliefs. It is similar to a REJECTION of beliefs that were once held and accepting different beliefs and might even be a rejection of the beliefs that were previously held. Apostasy can also be considered an ABANDONMENT or defiance of what was previously held to be true and practiced while rebelling against those same beliefs and practices. Someone or some group (nation) who does this are considered an APOSTATE. The word “contend” in this verse comes from the Greek word “agonizomai”: “To contend about a thing as a combatant.” [NOTE: “contend” also used in verse 9, but the translation is “to separate oneself from”]. The JUDGMENTS that God allows to fall on a rebellious nation or individual is never pleasant and often misunderstood in their purpose. While our Just, Righteous, and Holy Heavenly Father must JUDGE SIN and cannot allow it to continue, His JUDGMENTS are always tempered with MERCY & A PROMISE of ultimate deliverance ‘IF’…those under judgment would only turn back to Him. As he weeps in sorrow for the condition of his own people, he is a type of our Lord Jesus Christ as He stood and wept over the sinners of our world. “O Jerusalem, Jerusalem, murdering the prophets and stoning those who are sent to you! How often would I have gathered your children together as a mother fowl gathers her brood under her wings, and you refused! Behold, your house is forsaken and desolate (abandoned and left destitute of God’s help)” (Matthew 23:37-38 Amplified Bible). JESUS still stands today looking down from Glory, looking at each person on earth one at a time and at each nation in turn, and America that was so blessed–cries those same words. How Great is His love for America? For your nation? With all of His Loving Kindness for every man and woman–so much so that He died on the Cross for each one of us, and YET…He must and has begun to send JUDGMENT because of our rebelliousness–the APOSTASY as a people and nation. Prior to and after World War II, America was looked upon as the friend of the world, the PROTECTOR of all that was GOOD. Every nation, even our enemies, held a healthy respect for the BLESSINGS OF GOD and the things that were good about our nation. Since the 60’s with the Vietnam Conflict, and continuing today, our power, prestige, and will as a nation, has been on the fast track into oblivion. The secular world has paralleled our slide to destruction similar to the Roman Empire as it began to crumble, not from attacks of outside enemies, but from corruption and sin within. The stated examples show what I believe America is already experiencing under JUDGMENT from God by its corruption and sin. How deserted lies the city, once so full of people! How like widow is she, who once was great among the nations! She who was queen among the provinces has now become a slave. Bitterly she weeps at night, tears are upon her cheeks. Among all her lovers there is none to comfort her; they have become her enemies. America has always been known as the “great melting pot” of Humanity. People from all nations still come to our country with high hopes and dreams of prosperity and freedom. It is a testimony that the BLESSING of Almighty God, even when America is in trouble, is still GREAT, economically and militarily. BUT, the GREATNESS is quickly fading. “America is great because America is GOOD. If America ever ceases to be good it will cease to be great” – ALEXIS DE TOCQUEVILLE, a French Historian, upon visiting America in the early 19th Century. I believe that America has fallen CAPTIVE to her enemies as well. Our GREATEST ENEMY is NOT Russia, China, or any other nation or terrorist group. We are our own greatest enemy! In the early ’60’s during the days of the “former” Soviet Union, Nikita Khrushchev, the then Russian Premier, pounded his shoe on the podium of the UN and shouted to the West, “We will bury you!” The words certainly got all of our attention. Fearing an invasion from Mother Russia, America proceeded to build the most awesome Military Machine in history. Unfortunately, we forgot something to guard our political homefront being taken over by socialist-communist-liberal activists; who would gain office and destroy American law by the process of gradually installing Communist agenda within our legal system in separate branches of government. Americans, being the most NAIVE people among the nations, now believe that COMMUNISM is dead. The real truth is, COMMUNISM has just switched names to become more “politically correct.” Today it is called “International Democracy.” America has now become part of the New World Order atheist government. In my Detective investigation over the past week, I found this interesting document by Karl Marx. You tell me whether we–you, as a nation, have been led down a long road to CAPTIVITY and, we willingly went along and let it happen. 5. Centralization of credit in the hands of the State, by means of national bank with state capital and an exclusive monopoly. 8. Equal liability of all to labor and establishment of industrial, armies, especially for agriculture. 9. Continuation of agriculture with manufacturing industries; gradual abolition of the distinction between town and country by a more equable distribution of the population over the country. 10. Free education for all children in governmental schools. A combination of education with industrial production. Becoming a SLAVE to our own laws, that restrains its FREEDOM and “chained” by its own weighty laws restricts every move we make. There is too much infighting and division to accomplish anything. Are you listening ‘Mr. Government’? Just as an individual in becoming a SLAVE to SIN in their life, my country has become a SLAVE to its own SIN. All of our attempts to right every wrong, through Presidential Press Releases, through legislation…instead of REPENTANCE OF THE HEART, created a massive compilation of LAWS which chokes us into servitude. While most LAWS are meant for our good and for our protection, we’ve overstepped the boundaries between LEGALISM & COMMON SENSE care for ourselves. ISRAEL had become so adulterous from worship of idols, they couldn’t remember the days of walking in RIGHTEOUSNESS & HOLINESS before the True God. Falling so far, so quickly that their younger generation didn’t know the God of their fathers; no recognition of Israel’s BLESSINGS of the past. They lived with an attitude that was now the NORM for the people. SIN had magnified itself so greatly, as to hide the fact, a PATH of righteousness was to follow. My Nation, your Nation, is so caught up in gaining wealth…creating a great lifestyle…self-indulgence at all costs, we have forgotten the PATHS of goodness and righteousness presented in GOD’S WORD–your bible. AND…if you are thinking that the Church is absent from this picture, think again! I see it repeated in Social Media daily, without thinking about what they’re sharing, or displaying to the world. Am I being too legalistic? You will have to decide. OUR YOUTH in the land don’t understand, and haven’t heard of the SACRIFICES in the Biblical foundations of our country. They don’t know the price of FREEDOM because they haven’t been taught. AMERICA is a great nation ONLY…because of the BLESSINGS of the LORD upon it. A RIGHT to health care. All without any of the responsibility and accountability that accompany these RIGHTS. As a nation, we are becoming lazier each and every day. We give no thought as a nation about God or Holiness at all! Lord, how long will Your LOVE continue to BLESS AMERICA, even in JUDGMENT? Let your MERCIES be extended to us as a nation. Holy Spirit, move in your people. Let there be a great REVIVAL UNLEASHED OF RIGHTEOUSNESS & HOLINESS UPON OUR LAND. America is ceasing, perhaps has already ceased to be GOOD. 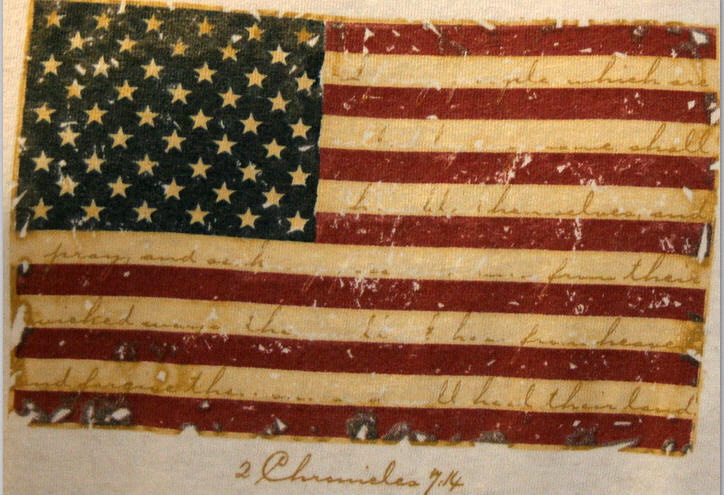 How long can God BLESS a nation who has turned its back on God? Calling her back to the fold. Calling the young and the old. IF My people, who are called by My name, shall humble themselves, pray, seek, crave, and require necessity My face, and turn from their wicked ways, THEN will I hear from heaven, forgive their sin, and heal their land (2 Chronicles 7:14 AMP). This is a great promise from God’s Word! HELP US LORD, as a people, as individuals, and as a nation to fall our face in REPENTANCE of our sins. HELP US to humble ourselves before You, to seek Your face and pray for deliverance. God loves you and I. But God’s LOVE must, one day, give way to justice & righteousness. Let the body of Christ–the Church, across this nation, cross your nation, CRY OUT to God in REPENTANCE and PRAY for Revival in the Lord. And REVIVAL always begins in the heart of each and every individual. Unless we do, there is little HOPE that we will survive as nations enjoying PEACE & PROSPERITY. For God’s JUDGMENTS will increase. We’ve only seen the tip of the iceberg in the trouble to come. 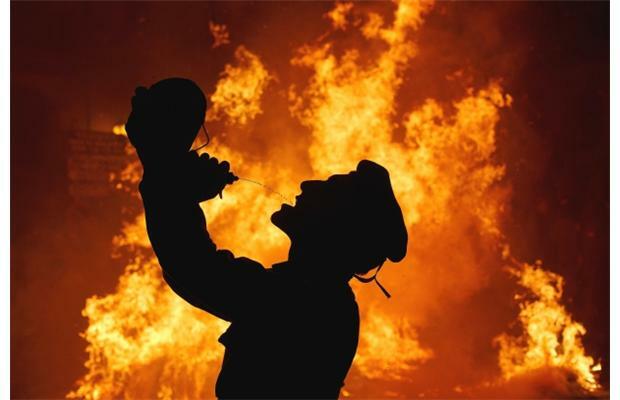 If we, as nations in the world, don’t turn to God in REPENTANCE, social unrest will lead to all out rebellion in the streets and anarchy will reign. America’s main problem is not social unrest, or lack of health care, inequality of opportunity in the inner cities, poverty or any of these things; although all of these are problems that must be dealt with. America’s main problem is…we’ve left worshipping the God of Heaven and taken JESUS out of our lives PUBLICLY; removed the Word of God from anything that’s PUBLIC. If God’s going to BLESS AMERICA…BLESS YOUR NATION…we all must see those trends reversed. Opening Statement – [i] Exerts used from the Amplified Bible (a). “THE TEN PLANKS” – [ii] The TEN PLANKS of the Communist Manifesto – http://www.criminalgovernment.com/docs/planks Communist Manifesto-All Ten Planks…In America!!! Photo Credits: BEWARE… found at courting of a kingdom.workers.blogspot.com; Google Image Search. 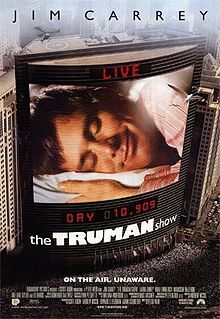 There was a movie a few years ago, with the actor/comedian Jim Carey as the lead, The Truman Show. The storyline was about a man named Truman Burbank who was adopted as a newborn by a large Corporation. The corporation created an entire city on the movie set with 5000 cameras, then placing Truman in the artificial city without Truman knowing it was all a fake. Of course Truman goes through life in Seahaven (the artificial city), thinking everything and everyone around him are real. Truman was perfectly happy and content for 30 years, with a perfect sky, a computer controlled climate, and a wife and friend who are really actors, and so forth. I think you get the picture. It is the only REALITY Truman knows! At least until a series of accidents start and Truman’s questioning of this “REALITY”, and he finally begins figuring it out for himself and walks off the set into the REAL WORLD. “Is belief in God like Truman in The Truman Show?” Some people think so. Critics claim it’s all because… it is the only reality that “religious” people have been presented. The movie set experience of “organized religion” has meticulously manufactured and manipulated circumstances, causing people to live in the ILLUSION of God. These same critics point out, there’s no denying that people who say they BELIEVE IN GOD are real, are happy, and content…even as Truman was happy and content in his world. However, behind the set, there are merely human directors who are pulling the strings, orchestrating all the right circumstances to make BELIEF in God appear real. 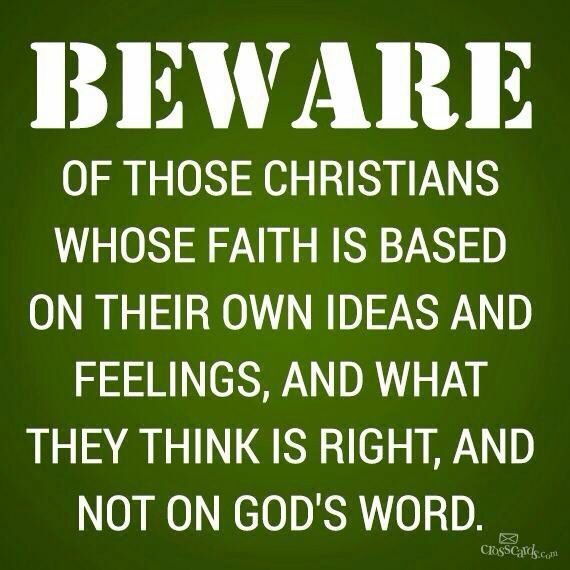 Whether that’s true or not, I’m only pointing out what some people are saying about Christianity. True liberation comes as it did for Truman; to turn our back on our make-believe world and venture into the real world…a world without organized religion pulling the strings. CHURCHES shouldn’t be an ORGANIZATION in the first place. They should be considered an ORGANISM–a living, breathing, GOD creative entity. The American Population Believes that God Exists! At least 95% do (Gallup and Lindsay 25). According to George Gallup’s 1999 poll, interest in God and spirituality is on the rise, not declining (10). Yet when we begin to ask what kind of God is that exists, people are less sure. Some people envisions of God is impersonal, like the FORCE in the movie Star Wars. Or view God as a benevolent Santa Claus, a God that has no higher goal than our happiness and success. The Bile clearly teaches that knowing God is for real; that He’s NOT our fulfillment as an elaborate scheme orchestrated by people, like myself. 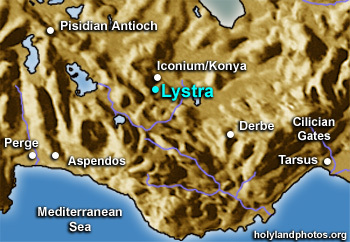 In the city of LYSTRA, which was basically an isolated, unimportant, backwoods area of the Roman Empire. People living there were all illiterate, superstitious, and accustomed to a rural way of life. When Paul and his friend Barnabas arrive, God enables Paul through the power of the Holy Spirit, to perform a MIRACLE, where a disabled man was suddenly able to walk. People were so amazed, their superstition takes over and they try to WORSHIP Paul and Barnabas as Greek gods Zeus and Hermes. Paul and Barnabas are only messengers…ordinary guys bringing the message of the GOOD NEWS (the Gospel) of God. Now the citizens of Lystra weren’t JEWISH, they didn’t know the Old Testament story of God creating the heavens and earth, of God choosing Abraham in establishing the nation of Israel. Instead, they were PAGANS…worshipping the traditional Greek and Roman gods. Paul’s challenge to the populace was to turn from their “worthless” superstitions, to the LIVING GOD. In case you’re wondering, the word “worthless” here means: EMPTY, UNPROFITABLE, VAIN , AIMLESS , HOLLOW- the “absences of purpose or ground or failure to attain any true purpose. [See Footnotes [i]]. Their WORSHIP was empty, hollow, because it was just words– Zeus and Hermes and the other gods didn’t exist in reality. BUT, the LIVING GOD is the God who is SELF-EXISTENT; the God who depends on no one! All because He is the LIVING GOD; He created ALL life, whether it’s life in the air, life on earth, or the life in the sea. God had been working through the nation of Israel up to this point. He allowed the rest of the nations to go their own way. God was preparing the way of the birth of His Messiah, His Son, to bring God’s blessing to the rest of the nations. But until then, God wasn’t directly reaching out to other nations. Take Heart…God Hadn’t Abandoned the other Nations! God left a WITNESS of Himself among ALL PEOPLE everywhere. God had left the nations evidence, “CALLING CARDS” about His existence. So how can we know GOD is for real? Where is the EVIDENCE? Because of His “calling cards” He left us to see. God’s fingerprints are all over the world we live in…IF, we take the time to investigate. No one clue is inclusive in itself. It becomes the cumulative effect of these clues that builds a strong case that GOD IS FOR REAL! If God made the EVIDENCE His existence so conclusive, every rational person had to BELIEVE. But God wants people to BELIEVE in Him freely, out of LOVE, so He leaves enough evidence for the seeker to know He’s there. If you’re not looking, not seeking and you don’t want to see it…the EVIDENCE can be easily overlooked. “For that which is known about God is evident to them and made plain in their inner consciousness, because God [Himself] has shown it to them. For ever since the creation of the world His invisible nature and attributes, that is, His eternal power and divinity have been made intelligible and clearly discernible in and through the things that have been made–His handiworks. So [men] are without excuse–altogether without any defense or justification” (Romans 1:19-20 AMP). In many ways the people of Rome were similar to the people of Lystra, except the people of Rome were educated, civilized pagans. In the context, Paul is describing why God’s wrath against sin was being revealed against ALL PEOPLE everywhere, religious and irreligious alike. In the verses above, Paul tells us that certain things about God can be known once for all. Even though God’s WHOLENESS might not be known because human minds are limited and confined–a MYSTERY (Romans 16:25-27). But there are certain things we can know about God; these things include God’s eternal POWER and the invisible characteristics that make God who He is! God makes these things “PLAIN” TO ALL PEOPLE! The word “plain” means obvious, evident, clear and well-known. God’s attributes aren’t only for the “spiritually” endowed Christian, but according to Paul, they’re evident to everyone. Because of this, no one can say, “But I didn’t know.” So this passage of Scripture in Romans 1:19-20, is taking us a step further than the previous verses given in Acts. Paul’s not just saying the universe contains the EVIDENCE, but we can know God is real because He reveals Himself …THROUGH THE UNIVERSE. In other words, God is actively speaking through His creation, making His invisible attributes visible and clear. All physicists today believe in the “BIG BANG”–that the universe spontaneously came into being by an enormous explosion. 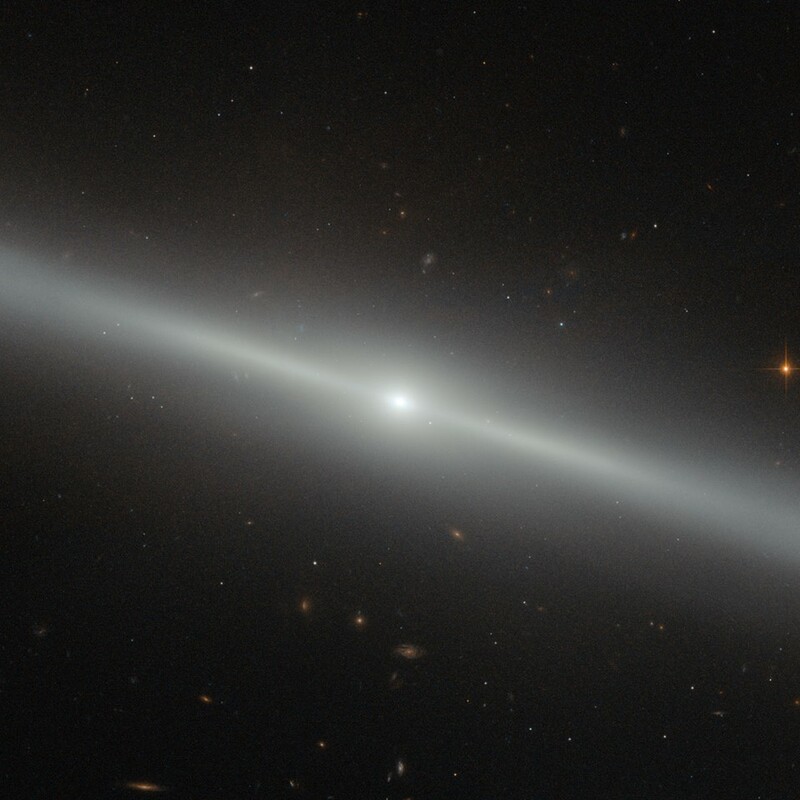 Beyond the “big bang”, physicists are speechless, because that’s delving into an unknown world of MYSTERY. Yet it makes perfect sense the big bang was generated by a God of ETERNAL POWER in the verses of Romans 1. The more we learn about the physical world around us, the more complex we realize it is. One strand of DNA contains enough information to fill all the textbooks available. But the COMPLEXITY is so finely tuned…perfectly designed for life to exist. This REVEALS GOD’S WISDOM designing such a complex world in such a way, enabling LIFE to flourish. Since some things are MORALLY right and some things are MORALLY wrong, it points to a LAWGIVER, a morally JUST Being who created right and wrong (Genesis 3). Now the question immediately arose when I was doing my investigation, if God makes Himself clear that He is the Creator of the Universe, why are there atheists and agnostics everywhere I turn these days? ATHEISM is a form of denial. Just like alcoholics who become more and more blind to their problem the more they drink, we become more and more blind to God’s Light the more we sin against God. Eventually, we reach the point we truly believe God’s not real just like the alcoholic reaches the point he truly believes he doesn’t have a drinking problem. Paul is saying to the Athenians, we ALL come from a common ancestor. Now the Athenians were defensive and believed that their race was superior to all others. They didn’t need another god–they already had plenty to bow down to as it was! But Paul claims we all share an ancestry that God Himself was responsible in arranging the basic circumstances of our lives. God did this so we would SEEK Him. God’s PURPOSE in placing you and I in this time, and this place, this part of the world we reside, and as you are reading this blog-POST, was for you to SEEK HIM! God designed us to not only SEEK, but to REACH for Him. The word “REACH” describes the groping and fumbling of a blind person. Left to our own resources, we are not equipped to actually find God. But like blind people, we’re trying to hike an unknown mountain trail without a guide and we’ll get lost along the way. So we if we SEEK without a guide, we are unable to find God. There’s a “god-shaped vacuum” in the heart of every person. God designed each and everyone to SEEK HIM. IF GOD IS REAL, then the parallel to The Truman Show is correct, except it’s those who reject God’s existence that are living in a manufactured world. It is those who are in REBELLION against God, who are avoiding Him because they want to live their lives, using a lyric from an old song…“My way” and where they are hiding in a make-believe world of DENIAL. The Calling as a Church…? Our calling isn’t to DEFEND God–He is perfectly able to do that Himself–we are to introduce people to a relationship with JESUS so they, like Truman Burbank, walk off their Seahaven set and venture into the REAL WORLD, the world God created and designed to live in. GOD’S KINGDOM. Drinking the Cup of Wine, Top to Bottom! For in the hand of the Lord there is a cup, and the wine foams and is red, well mixed; and He pours out from it, and all the wicked of the earth must drain it and drink its dregs. BUT I will declare and rejoice forever; I will sing praises to the God of Jacob. All the horns of the ungodly also will I cut off [says the Lord], but the horns of the [uncompromisingly] righteous shall be exalted. For God so greatly LOVED and dearly prized the world that He [even] gave up His only begotten (unique) Son, so that whoever believes in (trusts in, clings to, relies on) Him shall not perish (come to destruction, be lost) but have eternal (everlasting) life (Amplified Bible). Most people recognize this Bible verse. I remember a few years back when watching a football game on television, in the end zone crowds, someone would hold up a banner reading….JOHN 3:16. Here is one idea. It is much more palpable and sweet to discuss God’s LOVE and MERCY for sinners. We appreciate sermons on heaven and what it might be like, but we don’t want our minds to dwell on HELL, at least not very long. BUT what we need to get straight in our thinking about who GOD is…where there is LOVE, FORGIVENESS, and MERCY….there’s also anger and judgement. I am not, in this POST, going to write for your reading all the aspects of hell. But I am going to give some healthy attention to the judgement nature of GOD. REWARD or PUNISHMENT to those who side with the enemy (the devil). Personally, I like to hang my hat, so to speak, on the idea that GOD is a GOD of LOVE, GOD is LOVE (1 John 4:8). He would rather SAVE than JUDGE. But to prove His love and mercy, He demands and carries out justice against sin. The CUP of WRATH: “Upon the wicked He will rain quick burning coals or snares; fire, brimstone, and a [dreadful] scorching wind shall be the portion of their CUP” (Psalm 11:6 AMP). In my spirit, I’ve often asked in conversational prayer the question, “With all that is going on around us Lord, what would cause Your judgement to be poured out on the disobedient, the ungodly?” And as I patiently waited for answer, I was prompted by this thought; “when the innocent come under attack, God always responds”–when babies are killed by the millions in the name of abortion, GOD will respond! When the aged are a “problem to society” and euthanasia becomes a solution, GOD will respond! What is the SIGN of a Wicked Generation? Is it Drugs? Is it Gang Violence? Homosexuality, perversion? It begins when the sign of a people, moving toward judgment of GOD has no ability to defend themselves. GOD IS a GOD of JUDGEMENT! The One enthroned in heaven laughs; the Lord scoffs at them. Then He rebukes them in His anger and terrifies them in His wrath ~ Psalm 2:4, NIV. Arouse yourself, awake, stand up, O Jerusalem, who have drunk at the hand of the Lord the cup of His wrath, who have drunk the cup of intoxication and staggering to the dregs. ~ Isaiah 51:17, AMP. Then I took the cup from the Lord’s hand, and made all the nations drink, to whom the Lord sent me. ~ Jeremiah 25:17, NAS. …to make her drain the cup of His furious wrath and indignation. ~ Revelation 16:19 b. AMP. For God’s [holy] wrath and indignation are revealed from heaven against ALL UNGODLINESS and UNRIGHTEOUSNESS of men, who in their wickedness repress and hinder the truth and make it inoperative. ~ Romans 1:18, AMP. Though they are fully aware of God’s righteous decree that those who do such things deserve to die, they not only do them themselves but approve and applaud others who practice them. ~ Romans 1:32. The Cup of SALVATION: “I will lift up the cup of salvation and deliverance and call on the name of the Lord” (Psalm 116:13). Joy – (Matt. 18:13; John 1:45). Seasons of Refreshment – (Acts 3:19). Heavenly beings to stand in amazement – (Ephesians 3:10-12). Not just behavior but… (Romans 6:17-18). A position of authority – (Luke 15:22-24). An Abundant life…”I came that they [YOU] may have and enjoy life, and have it in ABUNDANCE (to the FULL, till it OVERFLOWS)” (John 10:10 AMP). Salvation gives you the PRIVILEGE of being chosen and appointed by GOD Himself ~ (1 Thess. 5:9; 2 Thess. 2:13). SALVATION MAKES ONE WHOLE...Gives meaning. “If we are being put on trial [here] today and examined concerning a good deed done to benefit a feeble (helpless) cripple, by what means this man has been restored to health” (Acts 4:9). Opens one;s eyes – (John 9:1-7). Saves and hides a multitude of sins – (James 5:19-20). Saves one to the “uttermost” [completely, perfectly, finally, and for all time and eternity] – (Hebrews 7:25). So there you have it. THREE CUPS mentioned in God’s Word and the significance they have to all mankind. Several years ago, my wife and I traveled to Central Texas to visit family and get my 98-year-old dad resettled in an assisted care facility. 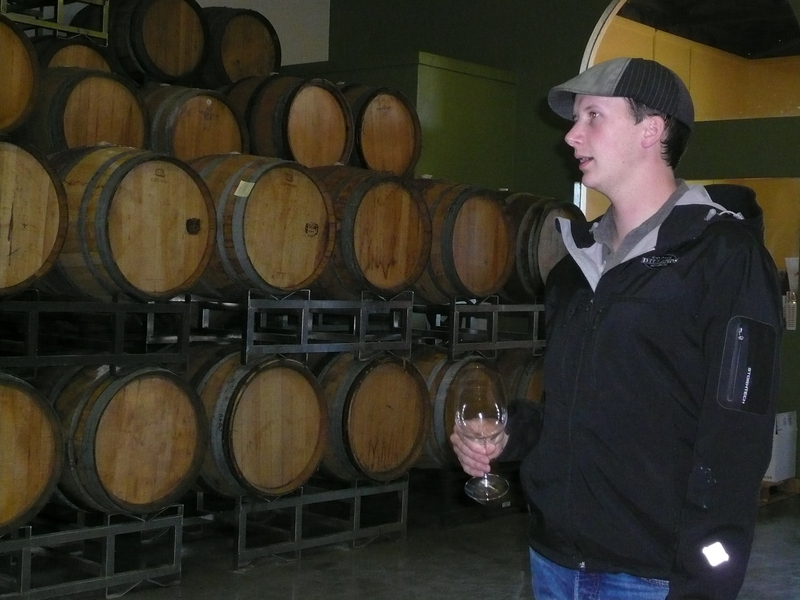 And while we were there, my niece’s husband Marc, took us to his place of employment at Inwood Estates Winery where they make wine from Texas grown grapes. Marc took us all on a tour through the winery, explaining technical terms to wine making (storage at the right temperature, aging, color, fermentation process, etc.). At the end of the tour, we all enjoyed a sampling from a wine storage tank. The Hebrew word used here -chamar-may mean either to “boil up,” or to be red; from the idea of boiling or becoming heated. The Septuagint (GREEK translation of the Old Testament); “and He pours out from it and all the earth must drain it”–describing that He draws it off, as is done with wine. The true picture being revealed here is probably the fermentation process; that the meaning may be, the WRATH of GOD seems to boil, fermenting the liquor. It’s full of mixture–verse 8–“well mixed”. It was quite common in wine making of old, to mixed the wine with spices, increasing its strength…or as we might say, drugged. This was done frequently to increase the intoxicating quality of the WINE presented. So the Psalmist is giving us the idea of the WRATH of GOD, being poured out like WINE, whose strength or power of intoxication was increased in effect by DRUGS. 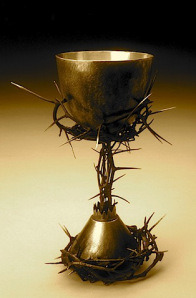 And He pours it out of a CUP, in order that His enemies may drink it, then stagger under the demonstration of HIS WRATH; as men stagger and pass out under the influence of spiced or drugged wine. The “dregs”– is what remains after the WINE is racked off (Isaiah 25:6). This would contain the strongest part of the mixture, the idea being, they would drink the WRATH OF GOD from the top to the very bottom of the glass. To the very last drop! In Biblical times, WINE was poured out and kept in skins. The picture, they would ring out these skins to get out “ALL” that was in them, leaving nothing remaining. Then DRINK…not merely the WINE, but the “dregs”, the “lee”…all that there was! Who are the “they s” in the verse? WICKED PEOPLE everywhere. The expression, “The Wrath of God” is not confined to one nation, or one people, but where ever wicked people are found, He will punish them. God is just in His dealings… to ALL PEOPLE. Who are “ALL PEOPLE” the psalmist talking about? The reference isn’t talking about Christian “backsliders”; believers who don’t go to church every week, drink a glass of wine, slip on spiritual banana peels on occasions. Asaph [A Psalm of Asaph] is referring to the unrighteous, the non-believers, the ungodly in the world. Notice the language here. It is the testimony of the singer (Asaph). He is making a VOW…to testify forever…what God has done! He is singing with JOY in the midst of what’s going on around him–“When the earth totters, and all the inhabitants of it, it is I Who will poise and keep steady its pillars. Selah [pause, and calmly think of that]!” (Psalm 75:3). Who is the “I” referring to? Not Asaph, but JESUS! Remembering who is in control of what’s going on, certainly brings JOY to my singing! The word DECLARE in verse 9, means to make oneself conspicuous of the message heard. John the Baptist was very conspicuous; in his diet of bugs and honey; he wore a leather suit and his MESSAGE was simple and consistent. Because of whom he was, what he did, the world stirred. Roman kings and religious priests came to him, confessing and repenting of their sin. Cutting Off the Horns…(Verse 10). Now the next phrase is really important. God is going to break or cut off the horns of the wicked. In my detective work this week, the description given certainly grabbed my attention. I found in research, that dehorning animals is a tough process and it’s much easier to accomplish when the animal is very small. Waiting until it’s older, the job is more difficult and risky to the life of the animal. The animal has to be immobilized, holding the head very carefully. Now on a younger animal that’s just beginning to grow horn buds, a hot iron is pressed around the buds, and the skin and cells are singed. With the older animal the horns are carefully cut away and then cauterizing the exposed blood vessels. Have you got a vivid picture with expression on your face? I did while researching the process and the Spirit wants to make things clear to the reader. So the term of DEHORNING is used in verse 10 because it is the ending of the wild nature of the people we are entrusted. It means they will have to TRUST their care-giver for protection and not to be able to use deadly force on others. It means that they will have to submit and not fight their shepherd. On the other hand, the RIGHTEOUS will have their horns EXALTED. If they have horns, they can keep them because they will be given the responsibilities of watching the flock. When the horns grow, they are honored. This demonstrates what’s happening in our lives today. “WE GIVE praise and thanks to You, O God, we praise and give thanks; Your wondrous works declare the Your Name is near and they who invoke Your Name rehears Your wonders” (Psalm 75:1 AMP).